Russia's Volga River is the largest river system in Europe, draining over 1.3 million square kilometers of catchment area into the Caspian Sea. 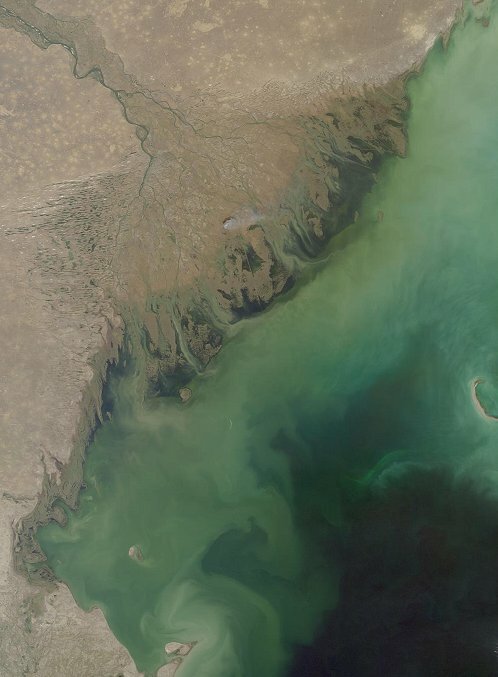 The brackish Caspian is Earth's largest landlocked water body, and its isolation from the world's oceans has enabled the preservation of several unique animal and plant species. 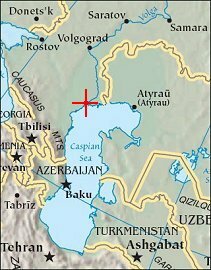 The Volga provides most of the Caspian's fresh water and nutrients, and also discharges large amounts of sediment and industrial waste into the relatively shallow northern part of the sea. These images of the region were captured by the Multi-angle Imaging SpectroRadiometer on October 5, 2001, during Terra orbit 9567. Each image represents an area of approximately 275 kilometers x 376 kilometers. The image is from MISR's nadir (vertical-viewing) camera. Other notable features within the images include several linear features located near the Volga Delta shoreline. These long, thin lines are artificially maintained shipping channels, dredged to depths of at least 2 meters. The crescent-shaped Kulaly Island, also known as Seal Island, is visible near the right-hand edge of the images.